The event was organised by “Byznys pro společnost” in cooperation with Zátiší Catering and the Prague Congress Center (PCC). The scene, decorations and refreshments were made in accordance with the zero-waste idea. Also the event branding was displayed on the digital navigation system via LED screens. This enabled the elimination of a lot of paper. The whole event was ecologically illuminated by LED lights. 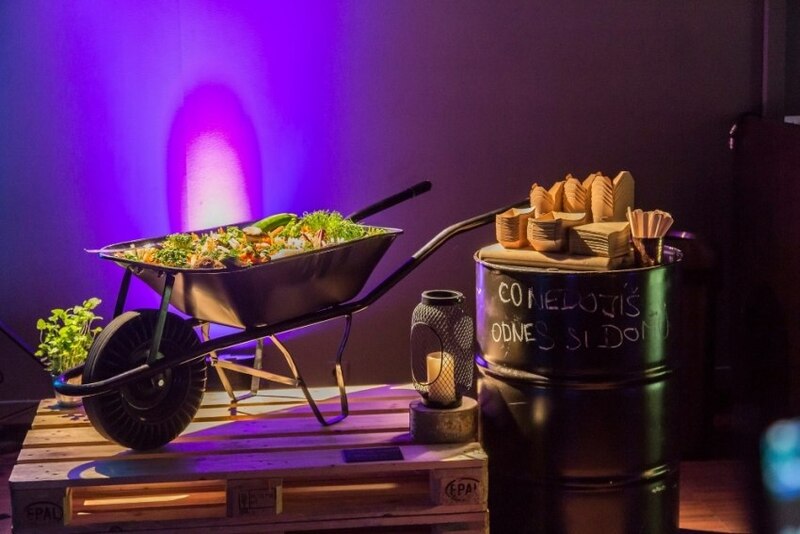 The catering was prepared in the same spirit: local fresh products; biodegradable containers; only one dining set available for each participant. The remaining food was offered to the PCC community fridge so all employees could taste and support the value ​​of the zero-waste concept. The community fridge project was launched together with Zátiší Catering in September 2018 and successfully helps to reduce waste of food and raise awareness of sustainable development thanks to the infographics placed on the door of the fridge. "The opportunity to host responsible companies has been a great occasion for the PCC to show that even congresses, conferences and corporate events can be organized with respect to the environment," says the CEO of the Prague Congress Centre, Roman Ray Straub. By being located directly next to the metro station, the Prague Congress Centre is accessible by public transportation hence the participants easily reduce their carbon footprint.